As our basically non-existent and fitful Summer turns to Autumn we get to start picking out wines that comfort us through the other ten wet, dark months of the year. What we're looking for during the wet, rainy season is a comfortable sweater, some comfort food and a comfortable wine. 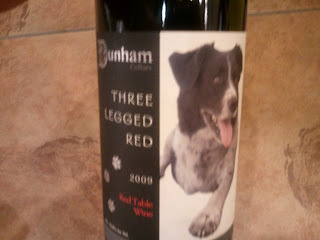 If wine were comfort food, it would be the Three Legged Red from Dunham Cellars. One of the few wines with dogs on them that we'll even consider. The image of the Port the long time companion of winemaker Eric Dunham graces this comfortable table wine. Port passed a way a couple years ago, but his image lives on in this wallet friendly blend of Syrah, Cabernet and Merlot which varies from year to year. The wine is a demonstration in dark fruit, cherries and violet aromatics. The Three Legged Red is just one example of Washington wine being so good that even this table wine will outclass and impress against many expensive red blends from that one state that starts with a C.
As many familiar with Dunham Cellars know, their top tier wines are excellent and the estate fruit that goes into the Three Legged Red comes from the same vineyards, and barrels that comprise the upper echelon Dunham wines. This wine though is a bargain at $20 and I've been seeing it around Seattle often for $16 and once for $11.99. The wine is widely distributed and can be found at larger grocery chains like QFC and Whole Foods. Please note, if you do find this wine from $11.99 after you enjoy it turn yourself into local authorities. At this price, it's akin to theft. Have a great weekend.